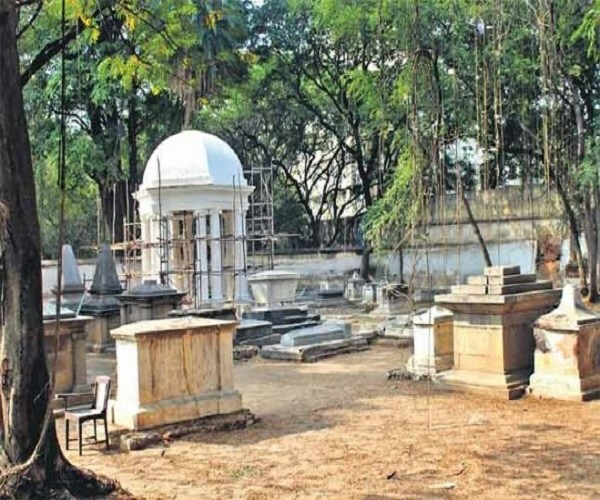 The historic cemetery in the premises of the Osmania University College for Women at Koti which has been lying facing apathy for long is finally getting a much needed restoration. The initiative that includes cleaning the place to restoring neglected graves of 42 Britishers, is to be completed by the year-end. The cemetery in the campus of Residency which is also known as Koti Residency and British Residency, is where 42 Britishers then serving in Hyderabad were laid to rest. Most of the graves were from the period 1807 to 1916 and included those of several important British dignitaries serving here including four Residents who passed away while in the office. Such has been the apathy for more than a century that the entire cemetery had wild grass growth taking over the premises, tombstones getting badly damaged and the compound wall is almost about to crumble down. The sprawling Residencey campus apart from the Residency building has Rang Mahal gardens and the cemetery. This cemetery demarcated by a low compound wall in an area of around two acres had been lying neglected with overgrown vegetation almost rendering the place inaccessible. Though it was in the year 1941 that a inventory was conducted, a proposal was made for restoration of the cemetery in 2010 by the British Association for the Cemeteries of South Asia (BACSA). ALSO READ: What's The Motive Behind Bifurcating 'Waltair Railway Division' Into 'Vizag Zone' In AP? The restoration works have been initiated by the Department of Heritage, Telangana along with the BACSA and Deccan Heritage Foundation, said NR Visalatchy, Director, Department of Heritage. The process of clearing the vegetation, excess soil deposits and preparation of estimates for complete restoration was completed during 2016-17 and it was followed by restoring the compound wall and taking up on priority the restoration of some of the critically deteriorating graves. The works on remaining graves is going on. The Department of Heritage officials said the works had been progressing at a brisk pace and were expected to be completed by year end. “We are currently working on creating a water outlet as the area is witnessing water stagnations during rains,” Visalatchy said. Previous articleWhy The Historical Golconda Fort’s ‘Moat’ Being Destroyed By GHMC For ‘Drain’ Constructions?